Produit Intérieur Brut – offering you the practicality and charm of vintage furnishings! PIB Home is something of a one-stop shop for all kinds of styles from yesteryear which have recently become firm favourites with the general public once again. Three major interior design trends: the industrial look, the retro look and the shabby chic look have combined to create massive demand for vintage furniture, especially from the post-war period. Designed with practicality in mind, many of these items are very robust and offer a modular approach to storage, which is becoming increasingly useful as living spaces become more and more cramped. PIB Home has a wide range of designs for all rooms in the house, including tables, armchairs, shelving, chests of drawers and accessories, as well as light fittings – perhaps one of the most crucial components of your home’s look, no matter how big or small it is. 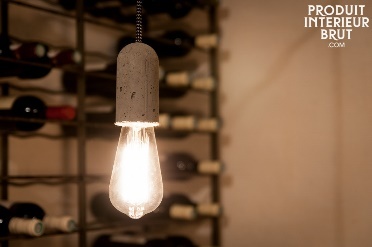 If you do have the luxury of a slightly larger-dimensioned place, then you might like to consider installing some industrial style lighting of the type shown below. The minimalist design of many of these industrial lamps shows off large spaces to very good effect.